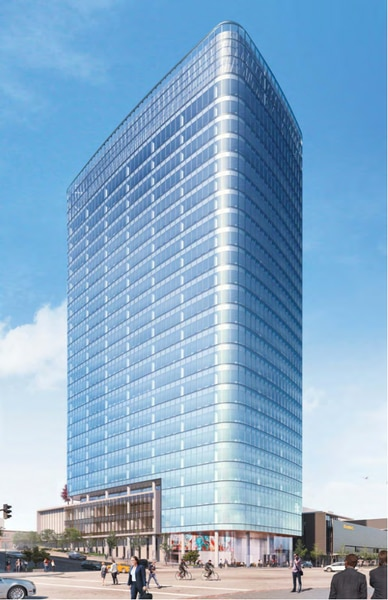 (Photo courtesy of Skidmore, Owings & Merrill via Salt Lake City Planning Division) Rendering of a new 28-story office tower proposed by LDS Church-owned City Creek Reserve at the northeast corner of State Street and 100 South in Salt Lake City. 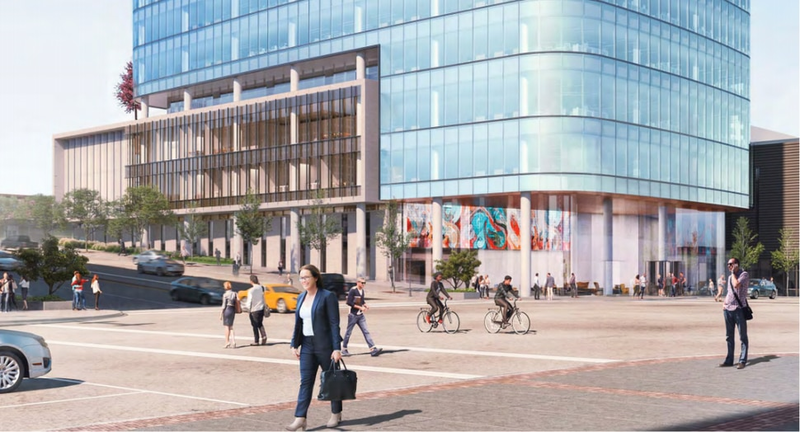 Building on their success with 111 Main, developers for the LDS Church are planning a new 28-story office tower in downtown Salt Lake City. City Creek Reserve, a real estate arm of The Church of Jesus Christ of Latter-day Saints, has submitted preliminary plans for a sleek, curving and glass-clad skyscraper on the northeast corner of State Street and 100 South, just west of the Harmons Grocery store and south of the church’s Social Hall Heritage Museum. City Creek Reserve spokesman Dale Bills declined to comment, beyond issuing a short statement saying the company was working to finalize city approvals for the luxury high-rise. The new tower would also be directly across the street from City Creek Center, the upscale LDS Church-built, open-air shopping and residential campus. The $1.5 billion mall, built during the Great Recession, opened to the public in 2012. Bills did not offer a timeline for the new building’s completion, but city officials say it could take up to five years. Initial plans for the project are emerging while several other additions to the city’s skyline are in the works. (Photo courtesy of Skidmore, Owings & Merrill via Salt Lake City Planning Division) Rendering of the street-level view of a new 28-story office tower proposed by LDS Church-owned City Creek Reserve at the northeast corner of State Street and 100 South in Salt Lake City. The church-backed skyscraper — being called Tower 8 / 95 State in city paperwork — is proposed to rise 395 feet in the air, according to blueprints from San Francisco-based architects with Skidmore, Owings & Merrill. That would require a conditional permit under Salt Lake City’s D-1 zoning for its central business district, which currently caps height at 375 feet. Drawings filed at City Hall show the additional 20 feet is meant to allow for a curved parapet crowning the tower — one of many visual echoes of 111 Main, which was designed by the same architectural firm and built by City Creek Reserve at Main Street and 100 South. Office space at 111 Main, rising from above the George S. and Dolores Doré Eccles Theater, has enjoyed robust occupancy since its 2016 opening, including a major presence by the global investment banking firm Goldman Sachs. Officials with the city’s Department of Economic Development say the city currently lacks a healthy inventory of office spaces of 50,000 square feet or more. (Photo courtesy of Skidmore, Owings & Merrill via Salt Lake City Planning Division) Rendering of the lobby and other street-level features of a new 28-story office tower proposed by LDS Church-owned City Creek Reserve at the northeast corner of State Street and 100 South in Salt Lake City. 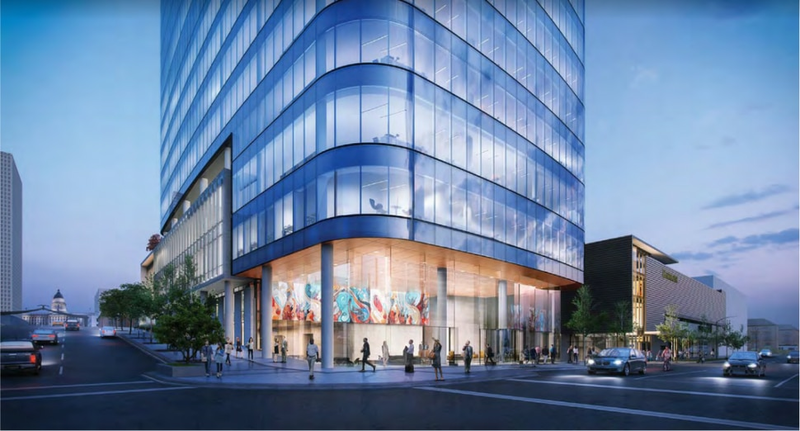 Like 111 Main, the new tower would boast a visually open lobby at street level, with 27-foot-tall glass walls and a 12-foot-by-80-foot digital media display inside showing images of Utah landscapes and works of art. The north end of the tower’s footprint would include a 3,460-square-foot, tree-lined plaza connecting to an existing plaza at the Social Hall museum. The entrance would be on 100 South. Parking would be incorporated into the tower, spread over two of its floors and the top level of the adjoining Harmons parking structure, with a joint entrance on Social Hall Avenue. Plans submitted to the city’s Planning Division could get an initial public hearing as early as January, though a city planner said nothing had been scheduled as yet. If approved and built according to early designs, the new tower would bump the 387-foot-high 111 Main from its current rank as Salt Lake City’s third tallest building, behind Wells Fargo Center farther south on Main Street, at 422 feet, and the Church Office Building at 50 E. North Temple, at 420 feet. Right now, another City Creek building — 99 West City Creek Condominium Tower — ranks as the city’s fourth highest, at 377 feet tall, according to a height ranking by the nonprofit Council of Tall Buildings and Urban Habitat, based in Chicago. As Utah’s urban core builds upward, even that height lineup is in flux. On Tuesday, government officials announced approval of $75 million in tax incentives for private developers Portman Holdings and DDRM to build a 29-story convention hotel with up to 750 rooms on the southeast corner of the Calvin L. Rampton Salt Lake Palace Convention Center on 200 S. West Temple. Groundbreaking for the $337 million hotel is now planned for fall 2019, according to Gov. Gary Herbert’s Office of Economic Development. It is scheduled to open in spring 2022. Also potentially joining the city’s skyscraper list is a 250-foot residential tower called Liberty Sky being planned for 150 S. State St. That’s slated to be a $90 million project by Utah developers Boyer Co. and Cowboy Partners and will reportedly include nearly 300 apartments and a rooftop swimming pool.